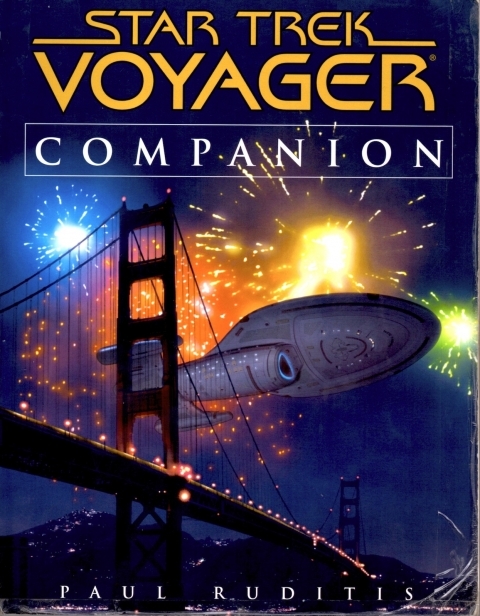 Ostensibly, the Voyager Companion follows in the footsteps of the TNG and DS9 predecessors; each episode gets a synopsis, plus some background information on how the episode was created. In fact, the book is a significant step down in quality (fitting enough really; the show was too). The amount of behind the scenes information is severely slashed. We get counts of the shuttles lost and such (and what kind of sad individual spends time collecting information like that? Oh yeah, I do...), but beyond that the information can best be described as "scant". We do get a look at the writer's guide from the first year of the series, and we get an intro to each season that discusses the changes that new produces made to the show. But overall it's a big drop in quality compared to the previous works.